Tracking of all customer queries. Access to the centralized knowledge base that enables contact center agents to accurately resolve complex inquiries and processes. The agents can also contribute to the knowledge base thereby capturing invaluable expertise on the fly. Varied collaboration options with experts within and outside the system. 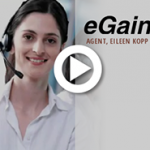 eGain Secure Mail™ to authenticate the customer before allowing the viewing of confidential information. eGain Fax™ to route, track, and respond to faxes with the same infrastructure that is used to handle emails and webform submissions.